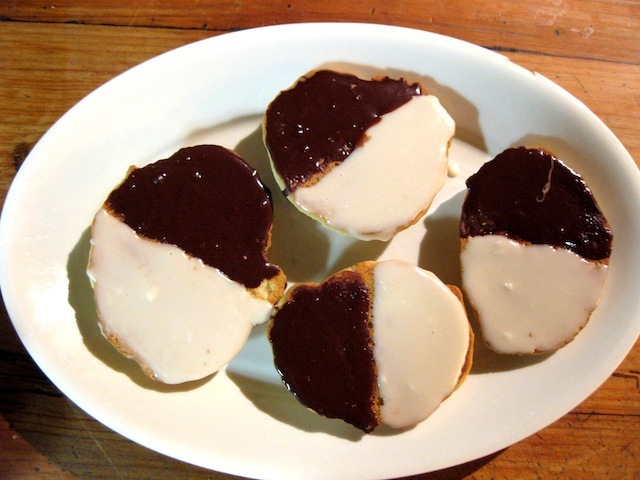 A New Half Moon, but Not Like Twilight (a post by Josh): Black & White Cookies – Eat Me. Drink Me. I have a few things to confess. The first is that I haven’t completely abandoned this blog. I know that it seems like it, since the last time I posted was about five months ago. There are a few reasons for that, for sure, but maybe no excuses. I can’t say that I haven’t been cooking since then, since I surely have. I also can’t say I haven’t been writing since then, because it seem like I’ve written about three hundred pages since that time. What I can say is that a few things have changed since August. I finished my southern culinary tour, I moved into a new apartment, I ran a half marathon, I gained a serious affinity for Kombucha and turkey curry salad, and I finished my penultimate semester at college. So where does that leave me? At home, thinking about my last semester at college, and a little uneasy. So what do I turn to? Writing, but of course! The other big thing I have to confess is: the inspiration to start back writing was both coming back home for the holidays, and (don’t judge) watching Julie and Julia. It’s not that I fell in love with that movie, but it’s that I realized that writing and food really are what I live for (I think that might be a line imbedded in that movie somewhere). So what do I write about, to get things started one more time? I could go back to where I left off and talk about canning strawberry jam with my grandmother in Gretna, Virginia. Or I might be able to talk about that one article in Gourmet that inspired me to write a whole post, without posting it. Or maybe, I could talk about the fact that my dream job came crashing down the day Gourmet died. I could talk about Thanksgiving and how my first pecan pie became my mom’s breakfast for the next week, because she loved it so much. I could hop back to Brussels, and talk about this time, last year, when I walked around the city holding a mug full of mulled wine in one hand and a warm Belgian waffle from a street car in the other, laughing with one of my best friends. Those might be upcoming posts; they all look pretty promising. But for now, I’ll tell a story of being home, waiting for next semester, and having too much time on my hands. I’m from New York. When I say that, I normally have to specify that I’m not from The City or even Upstate, but rather Central New York. If I don’t articulate that I come from a New York where cows outnumber people and snow-mobiles are the most common form of transportation from November through March, people generally assume that I’m from the Upper West Side, or SoHo or something like that. That doesn’t mean that I haven’t been to the city, plenty of times. Recently, I’ve been flying from North Carolina into the city to visit with good friends for a few days, as a transition back home. And it’s not like that’s a new thing – my being in the city – I’ve actually been going into the city since the third grade. I think that’s when I fell in love with it. All of the stereotypes got me: tall buildings, loads of people, hurried faces, stern walks, the subway, and endless amounts of food. I started to memorize places that we went to eat. John’s Pizzeria on Bleeker, Magnolia Bakery in the Village, Open Market in Midtown: All of these places are my almost go-to places when I get my feet back on the sidewalks (with the exception of Open Market, seeing as it’s about 100 dollars a meal). One of the things that I do remember vividly loving about the city is how much coffee my mom would drink. I didn’t drink all that much coffee back then. Now, it’s what keeps me going through the late hours of reading a book in one day or writing ten pages for the next day’s class. But then, I didn’t know about my to-be addiction. Instead, I’d get a hot chocolate or a muffin, but more often than not, I’d get a black and white cookie. I didn’t know if these were special to anywhere in particular, but my love of them started back in the city. The half white, half black, almost yin-yang symmetry always attracted me like a moth to a flame. I never did know what was my favorite, which side was better. I’d try to eat both at once, but we all know that we prefer one side to the other. I’d tell myself that I had to like both sides and tried to eat both sides equally – savoring both of them. I’d even try to remember what side I ended with last time – vanilla or chocolate. But I think I always ended with vanilla. Let’s press the fast-forward button, together, to speed up to present day. Yesterday, I was on a blisteringly cold run – I think it was fifteen degrees outside – and I started to think about what I wanted to cook when I got home. I cook at school, but I have nowhere near the kitchen that I have when I’m at home. If I did, it might be strange. “Hey look, the kid with way too much spare time to outfit his kitchen!” (points, stares, laughs). I can imagine it now. Well, by the end of my run, I was exhausted and decided: I’d make those black and white cookies that I used to love. I hadn’t baked in a while, and decided why not go big while I’m home. Get it? It might have been a coincidence that I hopped on Epicurious, and they happened to have a recipe ready for me. It might have been a coincidence that I was not planning on going out socializing last night. It might have been fate, and whatever it was, I spent about two hours on these cookies. And it was completely worth it. These things weren’t that hard to make, but came out perfectly. 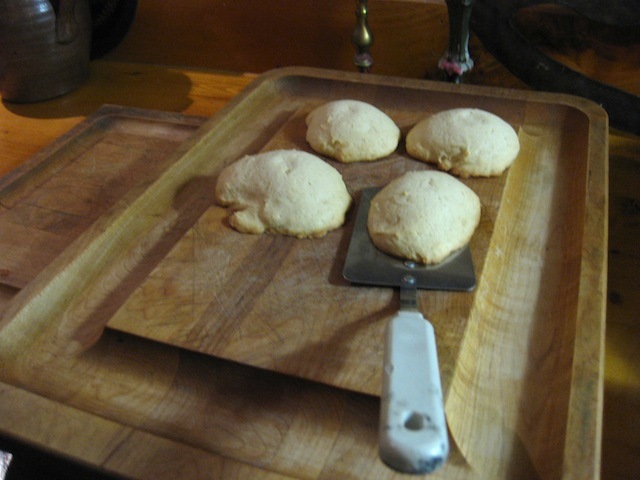 The dough was thick, like a drop-biscuits’. The icing was lemon-tangy and super-sweet. The cookies, rising up to the top of the oven, came out like little, moist, light cakes, and when they cooled, they never collapsed. They were proud cookies. I was a proud baker. The icing came out perfectly, too. I stirred the powdered sugar and water and lemon juice together and it became nice and viscous, but the minute I stopped stirring, it clotted up and became true icing – exactly what I wanted. It wasn’t actually until today at coffee that my mom confessed that the black and white cookies were her favorite cookies. I guess it runs in the family. Adapted from Gourmet’s 2002 recipe for some delicious half and half cookies. A few notes: Use buttermilk, it’s worth it. If you like lemon, double the amount (everything will turn out just fine). And last but not least, letting the cookies cool is crucial, so find a good episode of House (my new obsession) or something, and relax for a bit. Preheat oven to 350° F. Whisk flour, baking soda, and salt in a bowl. Stir together buttermilk and vanilla in a cup. Beat butter and sugar in a large bowl with an electric mixer until pale and fluffy, about 3 minutes, then add egg, beating until combined well. Add flour mixture and buttermilk mixture alternately in batches at low speed (scraping down side of bowl occasionally), beginning and ending with flour mixture. Mix until smooth. 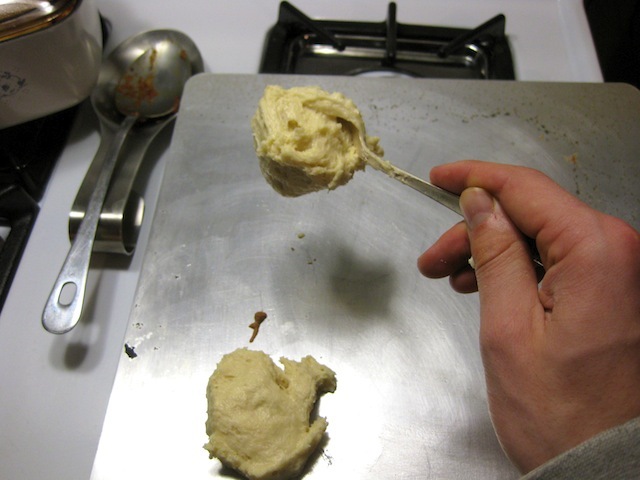 Spoon 1/4 cups of batter about 2 inches apart onto a buttered, large baking sheet. 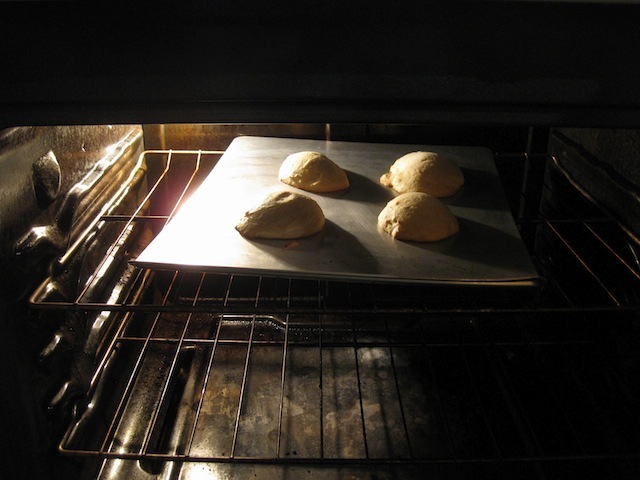 Bake in middle of oven until tops are puffed and lightly golden, and cookies spring back when touched, 15-17 minutes. Transfer with a metal spatula to a rack and chill (to cool quickly), about 5 minutes. Make icings while cookies chill: Stir together confectioners sugar, corn syrup, lemon juice, vanilla, and 1 tablespoon water in a small bowl until smooth. Transfer half of icing to another bowl and stir in cocoa, adding more water, 1/2 teaspoon at a time, until it reaches the same consistency as the white icing. 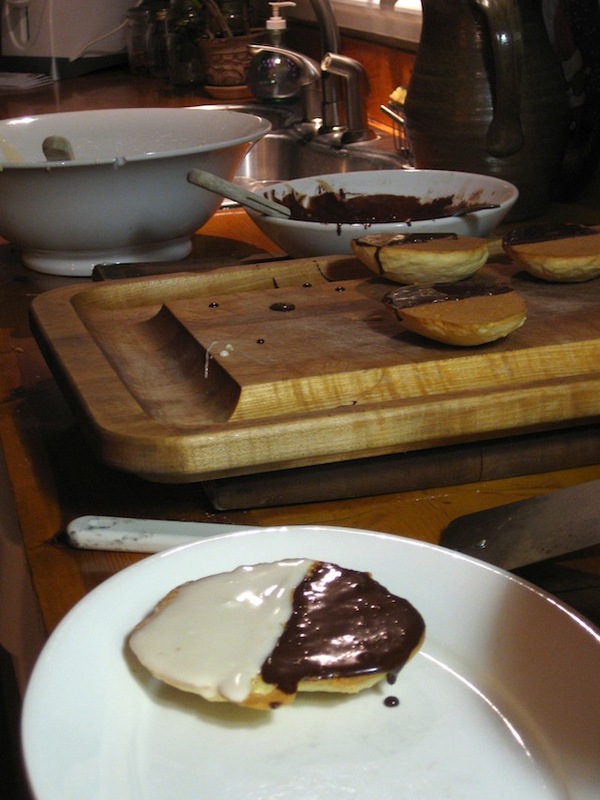 To frost the cookies, turn them flat side up, then spread white icing over half of each and chocolate over other half. Loved the cookies and actually ate one in the middle of the night! Wonderful to see you up and blogging again! Happy New Year!